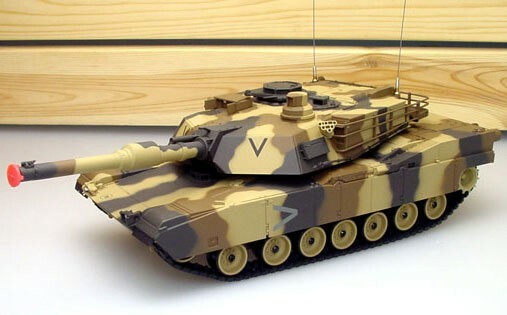 Master Box Dimension : 23" X 20" X 21"
This is 1:24 scale fully painted and assembled replica of the M1A2 Abrams Main Battle Tank, featuring radio control of all movement including independent turret rotation and gun elevation via a dedicated pistol-grip style controller. The turret is able to turn just short of a complete circle (300 degrees). Independent suspension and duel speed (via a boost button) allow it to overcome most terrains and minor obstacles. Its rubber belt-type tracks can climb a 35 degree slope with ease. For safety, two buttons need to be pressed together to shoot. A red warning light flashes when the tank is about to shoot. The firing mechanism can be switch off by a separate switch hidden under the hatch. A red rubber plug is also supplied for the cannon when run in non-firing mode.